Planed, live-edge walnut slab from Ohio Woodlands. The process of setting up or updating e-commerce, often triggers the need to reconsider shipping processes. The more complicated the shipping process, the more expensive the software needed to accommodate it. That means that it’s a important to consider whether adjusting the shipping process isn’t an easier fix. 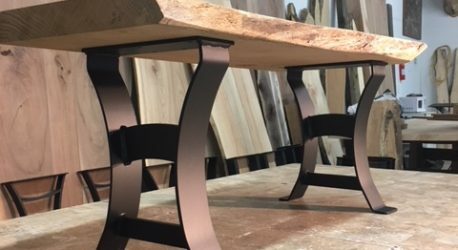 Jared Coldwell of Ohio Woodlands started his business with a product line of unique hardwood slabs. 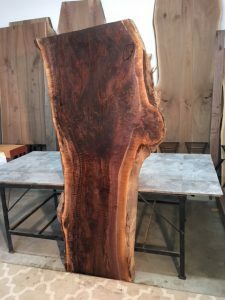 The slabs originated as a waste wood caused by windstorms blowing down walnut and other hardwoods at their family tree farm. In his first phase of selling online, Jared was selling the slabs to hobby wood workers through eBay. In 2008, with online selling experience under his belt, Jared wanted to expand his market, and needed the more professional online presence of a branded website. In his eBay experience, Jared had learned how to price his products, and he had learned that shipping large, heavy, irregularly-shaped products had unique shipping problems. Most of the items are over 100 lbs. 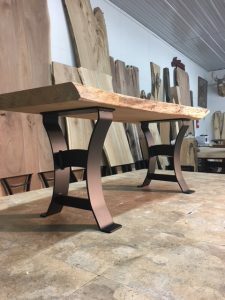 Example of table bases and legs, fabricated by craftsmen in Ohio for Ohio Woodlands. Since no two slabs are the same size, shape or weight, the shipping process is more complicated than for smaller, regularly-shaped items. Would shopping cart software accommodate this situation? After about an hour of discussion of various ways to handle shipping costs and pricing online, Jared decided to try the “free shipping” option. The idea was that even with the high cost of shipping such large items, it’s a convenience for Jared’s customers to just see the one price. By watching his overall shipping costs in comparison to what he is adding to the price of his products, he can make adjustments up and down without getting his clients involved in the process. Over the years, Jared’s product line and experience has expanded. He now carries metal table bases and legs, created by local Ohio craftsmen. These products are more regular in shape than live edge wood slabs. The weight and dimensions are not unique to each piece sold, taking out some of the complexity of shipping calculations. Ohio Woodlands goes through $500.00 – $1000.00 of packaging materials a month. 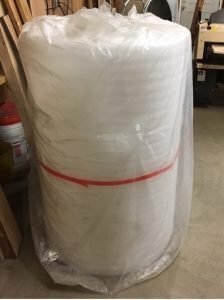 The cost of packing materials should be reflected in your handling charges. With the growth of his company, Jared has diversified his shipping processes and pricing to accommodate his diverse product lines. Jared no longer needs to use the “free shipping” strategy because his shopping cart software, 3D Cart, offers robust shipping calculations for the items that can be shipped through UPS ground. To accommodate weight restrictions on individual packages, orders may be broken up into multiple packages. Breaking up a purchase into multiple packages is not possible with a wood slab. But, Jared now has enough shipping orders for the large, irregularly shaped items, that he has been able to negotiate excellent shipping rates with several carriers. These are high ticket items and his clients understand that shipping will be in the hundreds of $$$. Jared no longer includes shipping in the pricing for these items. Instead, they are listed on the website, but the large items have to be phone or email ordered so the price can include shipping. Handling is a special consideration. 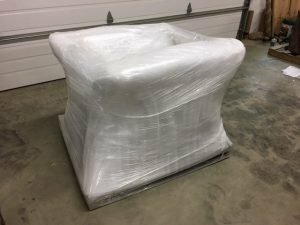 It might seem like a wood slab or a heavy metal table base would be impervious to shipping damage. But that is not the case. Packaging is very important. To assure the highest quality in packing, Jared does most of that work himself. The “take away” here is that specific shipping strategies, like other business processes, involve many factors. It’s important to reconsider and be willing to change when new options are available or when business changes require a new process.